Axoloti for analogue Clock/Sync - Volcas, etc? The GOOD news, is that putting scopes onto the initial patch (where I'd added the env/d) actually revealed that the timing of the clock was not changing at all, the envelope just re-shapes the clock into a longer sawtooth (see screenshot with comparison of env/d on top vs the non-env clock on the bottom). The in-between-good-and-bad is that even though the stop/start clock functionality is great, the clock does not "fire" on the first pulse every time, and seems to fire on the second instead. Actually, it is fairly inconsistent, sometimes firing multiple times on the "1", other times on the immediate upbeat that follows. This means that when I "arm" the PO by hitting it's play button (therefore waiting for a clock from the OP1) and then I hit play on the OP1, they hardly ever start together, as intended. I'm guessing this to be a phase issue? Does the clock send out an inverted signal, and the pulse is therefore on the downwards slope of the clock (or something)? Just re-visiting this after a few weeks away from the studio (which killlllled me!). I've just tried my patch again, and it seems to be working fine except for the start-point of the trigger as described in my last post: sometimes when th OP1 is triggered, the PO starts immediately, other times on the second 16th note of the pulse (i.e. slightly behind the beat). I'm still using the patch with the env/d in it (screenshot attached) as it seems to hold time very well, it's just the start point seems to be switching phase or something? @DrJustice any thoughts on how to have the phase reset each time? Just re-visiting it now and I can't quite seem to solve the following issue, as stated in the previous post: the above patch works perfectly to sync the Pocket Operator, except that it does not always clock on the "1". It seems like maybe the pulse generated from the env/d object is not always triggering from the start point, or something? I'd guess every 3 or 4 times it starts perfectly and syncs the PO well, but the times in between it seems to be a random gap/latency between hitting play on the OP1 and the sync pulse starting. I used this as a base to sync my Pocket operator to midi-clock from the axo using the headphone-out on the axo. stereocable in the headphone jack, right channel still available for other sounds! Do you have the problem you describe also when you sync using stereo cable in the headphone jack? or only when you sync using the GPIO sync? I don't seem to have the problem. Hey Kaos, sorry for the late response. 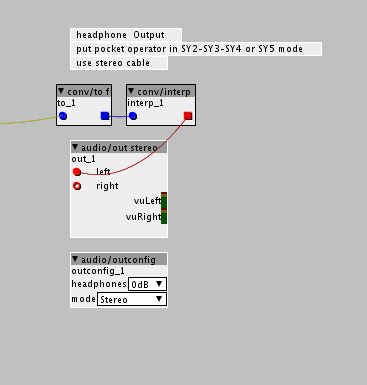 I haven;t actually used the Headphone out as you describe as I'm using the audio pathway of the Ax for FX. Can the headphone out be routed separately from the main output? That might be an easy workaround..